You are here: Home / How To Get Rid Of.. / How To Get Rid Of Foot Odor? Washing your feet with salt water, vinegar, tea, sodium bicarbonate, etc. are some of the most common home remedies on how to get rid of foot odor. 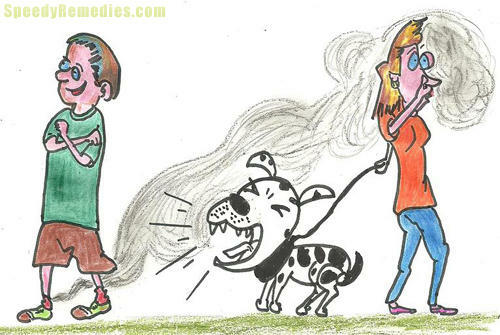 The stinking smell is caused by foot sweat accompanied by bacteria and inadequate air ventilation due to socks and shoes. Socks made of nylon and polyester, in particular, contribute in increasing perspiration. Thus, an easy way to avoid foot odor is to wear cotton or wool socks as they are more breathable. Given below are a few more tips for getting rid of smelly feet. • As foot odor is attributed to bacteria growing in the dark, damp environment created by your sweat and lack of ventilation, try to get rid of these micro organisms by washing your feet with an antibacterial soap or solution. Moreover, scrub and exfoliate the surface of your feet. • Soaking your feet in salt water (half a cup of kosher salt added in a quart of water) for 20-30 minutes is highly beneficial in getting rid of foot odor by reducing moisture. After doing this, do not wash your feet; just wipe them with a towel. • Applying a combination of tea tree oil and calendula oil helps a great deal in removing foot odor accompanied by caused by fungal infection like Athlete’s foot. • Boil a quart of water and add four teabags (preferably lemon tea or black tea) in it. Let it steep for 15 minutes. Soak your feet in this solution for about half an hour to reduce foot odor naturally. Follow this therapy two times in a day. Basically, the tannins in tea eliminate the bacteria.Here’s a video showing how to treat foot odor naturally with sage tea. • Take a bowl of warm water, mix two tablespoons of baking soda in it and wash your feet with this mixture every night as a natural home remedy for food odor treatment. You can add a teaspoon of tea tree oil as well. • Soak your feet in a bowl of warm water mixed with one-third cup of vinegar (you can use white vinegar or apple cider vinegar) for 15 minutes to get rid of food odor. • Take a cotton ball, soak it in vodka or rubbing alcohol and rub it on your feet to heal foot odor. You can also use a hand sanitizer on feet to kill bacteria. • When considering how to get rid of foot odor fast, try using a foot deodorizer or apply your usual deodorant on your feet to neutralize the unpleasant smell quickly. Placing cedar wood inserts in shoes is helpful in getting rid of shoe odor. • Needless to say, change your shoes and socks from time to time in order to prevent persistent foot odor. Plus, do not wear socks and shoes all the time; let your feet breathe.For instance, you can walk barefoot on green grass in the morning. It also helps develop muscle strength in feet and legs, and improves circulation. In addition, makes you feel relaxed and rejuvenates your mind. As this problem can be caused by factors like excessive sweating, hormonal changes, extreme anxiety and nervousness, etc., study the symptoms carefully to determine the cause to help you find the perfect solution. Check out this video explaining how to deal with stinky feet. Try to cure foot odor and excessive perspiration as soon as possible to avoid the chances of developing infection. When dealing with severe foot odor, your doctor may prescribe an anti-sweating medication called Drysol. In case you are wondering how to get rid of foot odor in shoes then you can simply put cloves inside your shoes and place them out in the sun for a day or two. Moreover, you can dust some cornstarch, baby powder or baking soda (to absorb moisture and reduce bacteria) along with dried sage leaves (for fragrance) in your shoes. Leave the powder in shoes overnight. Placing charcoal inserts inside shoes also absorbs the foul odor. Besides, sneakers can be laundered and dried in air. It is suggested to wear shoes that are prepared from natural materials like leather, mesh, etc. instead of plastic or rubber.